But I’m lucky, because I have something that keeps me sane, even in the most difficult circumstances: my writing. That’s right. Even though writers aren’t always known for being the most stable bunch (Hello, Sylvia Plath! 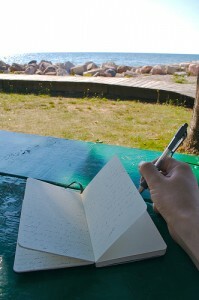 ), I truly believe that my lifelong habit of writing has helped me stay (mostly) emotionally sound. And the fact that I can publish some of these writings so that other people might relate to and benefit from them? Awesome. Just awesome. The only thing that comes close to the feeling I get when someone writes to tell me how much they enjoy or relate to my writing is when one of my personal-essay students tells me how much my feedback meant to them. One student, after I sent her her final essay critique at the end of class, wrote, “…when I read your comments, I just cried and cried. My family life is so difficult and it felt like a ray of confirmation that I’m on the right path in spite of everything. The upside is that I always have essay material.” She went on to publish her essay almost immediately. In my class students can and do write about anything, but it’s not surprising to me that many essays are about difficult relationships, startling diagnoses, and loss. Through the act of writing about these things, they’re processing, understanding, explaining, accepting, and reassuring others who have been in their shoes. It’s also not surprising to me that these are often the essays that seem to be the most rewarding for the writers – and often, the most frequently published. If you’d like to explore writing about your life in more depth, I invite you to take my 6-week e-mail class, Personal Essays that Get Published. Students tell me it’s as much fun to take as I think it is to teach. (And there’s no rule saying you HAVE to write about death or divorce; many students write and publish upbeat essays. One of my greatest hits was about my belly button!) The registration deadline for the next session is Aug. 16. Find out more and sign up here. I’d love to have you join me. 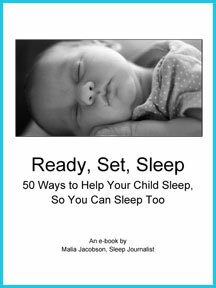 READ O’ THE DAY: Speaking of writing and maintaining your sanity, my fellow writer/mom and sleep expert Malia Jacobson has launched a new e-book called, “Ready, Set, Sleep: 50 Ways to Help Your Child Sleep, So You Can Sleep, Too.” The best thing about it, IMO, is that it’s full of specific, practical advice you can put into play TONIGHT. I’d say that’s well worth the price of a few lattes, wouldn’t you? I loved reading “In My Own Words,” and it was really intriguing to see how you used your journal and interpreted it in your writing. I have two bookshelves full of journals, dating back to elementary school, so I know they are rich in material just waiting for me to use them in my writing! I really would like to take your class, but with my husband deployed and expecting a baby I think it is best to wait. Do you offer this class once a year? I think this time next year I will be able to take it! Yes, I offer it a few times a year, Kim. I’d love to have you take the class – you’d do great! I really can’t wait to take it!! I’ve been wanting to do so for some time, but I want to make sure I have enough free time to do a good job with it. So please let me know the dates of the future classes when they become available. I can’t wait to learn more from you! Your article in Skirt is really great, to be 19 and go abroad on your own and live with an unknown family is just an amazing thing to do. As I read it I kept thinking about my very sheltered life as a “townie” college student, living in one half of a garage apartment, going to school, working every afternoon and weekends to make tuition and car payments. It never occurred to me to even think about going abroad at the time, I don’t think I was reluctant, it just wasn’t on my radar back then. That’s probably why I try to travel whenever I can now via cruises or short trips to see something new. It’s also why I help sponsor young folks getting out of college to try for Rotary Ambassadorial Scholarships… a year abroad as a student, an Ambassador and a volunteer. Their blogs and journals are very similar to yours, you can see them grow as a person during the year. They become more confident, they travel and see strange places and they learn that giving to others makes them such a better person. That’s so cool, Lou. I’m sure those students benefit in ways you can’t imagine. And it’s never too late to travel! I even like taking day trips when I can. Like you said, it’s about seeing something new. I think I write to remember sometimes. Remember times I thought I lost. Sometimes I write to vent. Sometimes I write because I’m feeling egotistical and want people to read what I have to say. As long as I’m writing, my world feels ok. I was so excited to pick up my copy of Skirt. I went out on my porch and took a moment to myself to enjoy the essay. It’s always neat to “hear” the voice we read online each day… in print. When I lived in Portland, I filled pages and pages of a journal. It no doubt kept me sane (or kept me from going crazy — semantics). That raw emotion was the top layer of two essays that eventually got published in Skirt, many blog posts and now the pages of a book. I should, eventually, burn that journal… but I probably won’t. It’s nice to compare and contrast the raw with the refined. There is nothing more grounding than being able to put your thoughts and feelings on paper! I know I’m really missing that in my life lately.